Make looking for a home easy. Search for any listed property here in our Southwest Idaho Intermountain Regional MLS. Let us find the perfect home here in the Boise Idaho area. The Cuff Team Welcomes You! Search the Boise MLS for Boise Real Estate, Boise Idaho RealEstate, Idaho Real Estate Listings, Southwestern Idaho Real Estate, and homes in the Treasure Valley. Let us help you find the Home of Your Dreams! Remember Dream Big! Don Cuff & Janice Cuff Realtors, Boise Idaho Real Estate. Meridian is located just 10 miles west of Boise, immediately accessible from Interstate 84. The city’s 2002 estimated population was 44,962. With my 14+ years of experience, I have helped many people, like yourself, make their home buying dreams a reality. I will make every effort to provide you with a closing that is pleasant and uneventful. Please contact me if you have any questions. Whether the questions are simple or complex, it does not matter. My time is yours and I look forward to giving you the best possible home financing experience. Why? Maybe it’s because residents from Idaho and abroad enjoy four distinct seasons but the weather is moderate enough to allow an average of 325 golfing days a year. Or maybe it’s the low crime rate, reasonable cost of living, or the committment of corporations and individual citizens to preserving Boise’s quality of life. With so much to offer it's no wonder that Boise Idaho has become a major hotspot for real estate; real estate market conditions have never been better for Idaho home buyers. Eagle is located 10 miles west of downtown Boise in Ada County, between the Boise River and the Boise foothills. From its roots as a small farming community in the late 1800s, Eagle Idaho grew slowly to a community of 2,500 in 1990. By 2003, the population was estimated at 14,000! Real Estate in Eagle Idaho is taking off! What was once farms and fields as far as they eye could see is now a tight-knit community of fine homes and charming storefronts. Homes in Eagle range from cozy 2 and 3 bedroom homes to grand custom homes on sprawling acreages. North Eagle offers a number of real estate opportunities for those looking to have a wonderful hilltop home as land is still plentiful for development and the natural landscape is ideal. Need to find a home in Eagle Idaho? Our Idaho home search can help you find the home of your dreams! 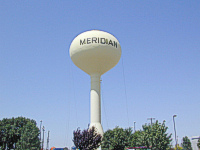 Like many Idaho towns, Meridian owes its existence to the development of an irrigation system. Its earliest settlers lived along Five Mile Creek, where water was available most of the year. The first school opened in 1885, and a post office opened along the rail line from Boise to Nampa soon after. When the Settlers Ditch brought irrigation water in 1892, the population grew. In 1893, an Order of Odd Fellows Lodge was established and chose the name Meridian, because the surveyor’s meridian passes through the town. Lodge members surveyed the town site and named it Meridian after the lodge. Today Meridian Idaho has blossomed into a thriving tight-knit community. This mid-sized town is strong in community spirit, from it's number of small local businesses to it's support of the local sports and racing clubs this warm, welcoming community offers the perfect home buying opportunity. For much of the past the population of Star Idaho has stayed at around 500--about the same as it was early in the last century. However, in recent years the population has grown and the 2000 census reports it at 1,795 people and growing. Despite its humble beginnings,Star Idaho remains the trading center of a working community which earns its living for the most part from the soil through agriculture, but this demographic is changing. 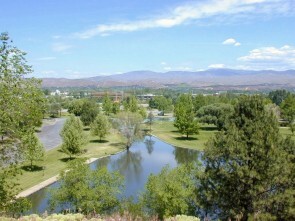 As growth in the valley spreads West more quality communities are coming to the area; real estate in Star is booming! Great recreation opportunities are just one of Star's attractions to would be residents, being located minutes from Eagle Island State Park, the Boise River, and several Idaho golf courses. Star is primely located for those looking to buy a home outside the city, but near to the comforts of city life. Want to find out more about the great opportunities for real estate in Star Idaho? Looking for a home in Star? Contact us today!